This painting has been on my easel several times over the past few months. I can't find any photos of it from the beginning, but I started mixing paint colors and putting shapes on the canvas in January. 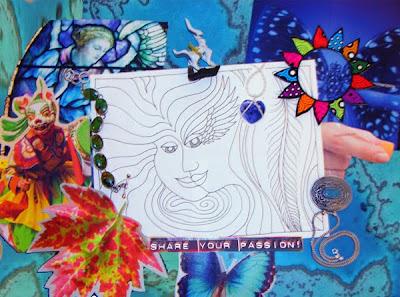 I'm sharing this process here as part of the 8 Day Abundant Art Show for emerging artists to share their work on social media. I was loving the shapes & contrast, bringing some elements forward and keeping some background in the layers. Letting go of some elements and bringing in some other shapes, loving the process and not getting too attached to outcomes... not easy. Deciding to darken some areas gave the opportunity to bring some new shapes and details in to the mix. Part of what I love about this process is the thoughts and journeys my mind takes as I mix colors, think about what shapes I want to use, how letting go allows me to listen to my instincts. True change comes from a place of love - a love of self. The Secret to the Journey to Health is learning to love ourselves. Having recently read the amazing book You Can Heal Your Life by Louise Hay, I've found so many things that resonate on this Journey to Health and being a health coach. 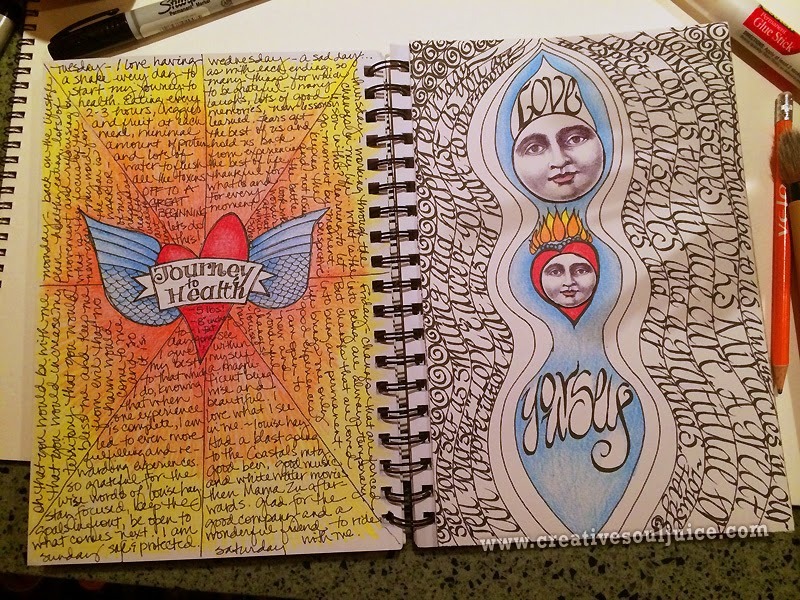 This latest art journal entry is an illustration about loving myself on this journey to health. I have long known that the weight is not about the food and the exercise as much as it is about the mindset. Our self loathing, lack of love for who we are, and our actions are what truly keep us on the continuing cycle to gaining and losing the pounds. We carry our extra weight as a shield of armor, protecting us from facing ourselves, dealing with our issues, and finding peace of mind versus looking at ourselves with lovingkindness and forgiveness. The river has always been a teacher. From the time I first dipped a paddle in the Rappahannock, to a recent paddle on the Shenandoah, the lessons continue. That old aluminum Grumman taught me a few things about rocks and hydraulics back in the day. When we threw a wee young boy in the boat and flipped it just before the first rapids in Fredericksburg, l learned about that survival instinct that kicks in for a mother protecting her young. I also learned how to use a paddle to avoid a spill. Many teachers, many lessons. 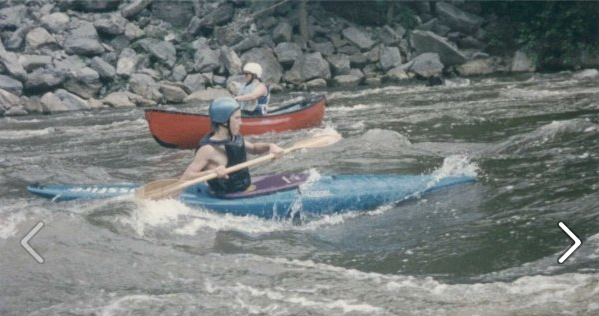 I’ve heard some real whoppers from sitting around a campfire with old decrepit liars, cried a more than a few tears when a fellow paddler took his last breath on the James in the rapids at Hollywood. Gained a life long friend at the funeral. The river has its gifts and its payments. Spending New Year's Day 2015 on making art and cooking was my objective this past week, and I wanted to do an art journal page on the word I've chosen to guide me through the next 12 months. This year I've chosen Warrior. I created a self portrait of myself with these words as the cover of one of my 2015 art journals. 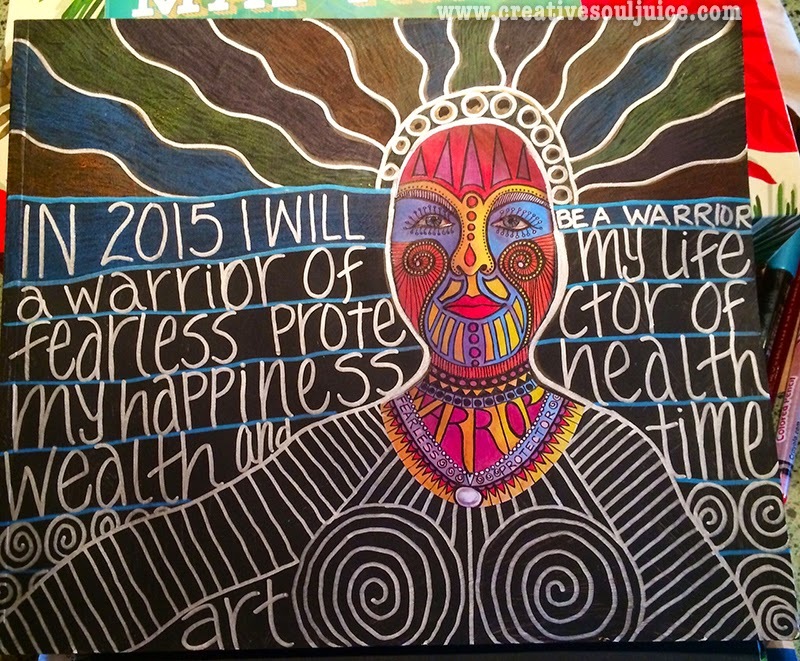 My mantra is to be a warrior of my life. A fearless protector of my happiness, health, wealth, art and time. I've learned to take daily actions in choosing happiness, health and wealth every day. Those actions each day bring me task by task to the place where I am now and want to be most. I want every day to be focused on choosing wisely how I spend my time, and with whom I spend it. 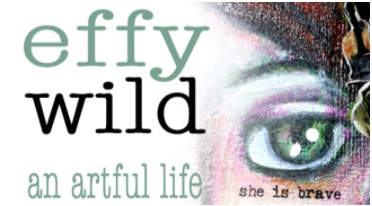 The lovely Effie Wild has generously offered a giveaway on her site that you should check out! 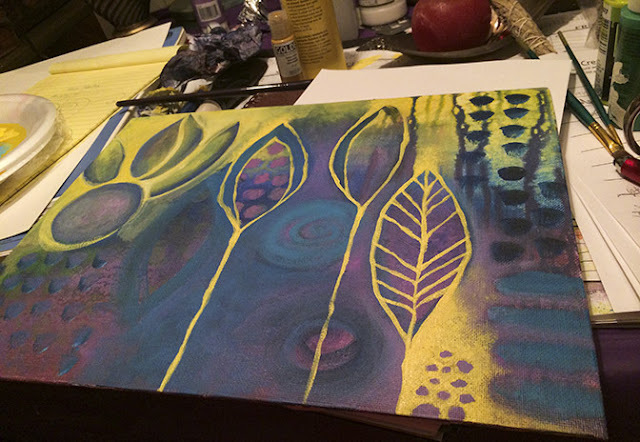 Effie is giving away two seats in an e-course painting class called Bloom True taught by Flora beginning on January 26th. 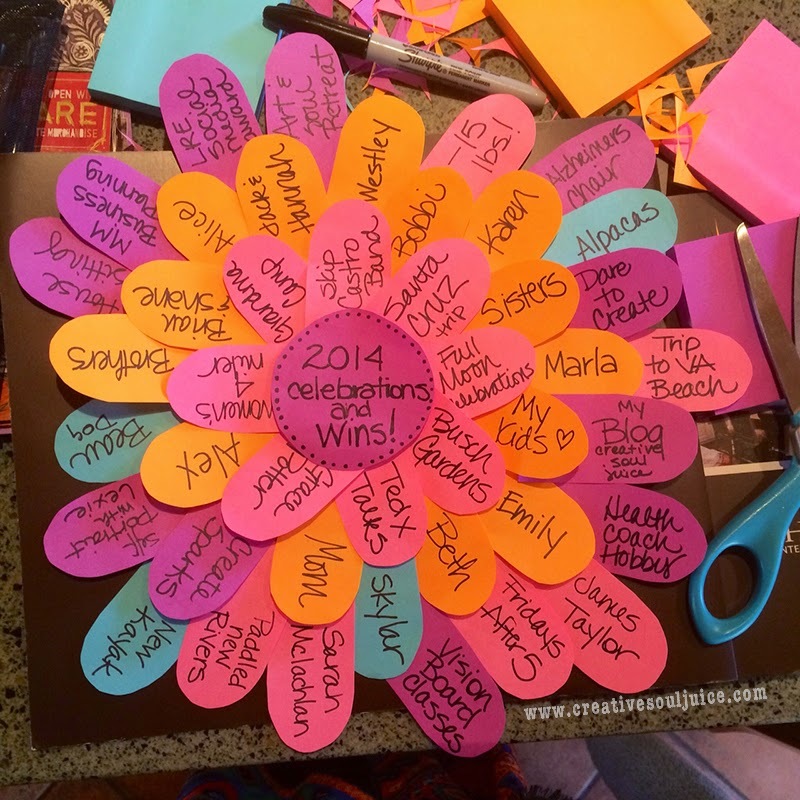 So get over there before Jan 12th (do this now before you get all partied out) and let's make more art in 2015!